The Prime Minister met families in Hexham today to discuss what Brexit means to them and set out her priority to make sure communities in the North East continue to prosper. PM Theresa May visits the local parent and toddler group at St Andrews Church of England First School. 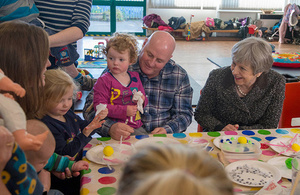 Marking the historic one year milestone to our departure from the EU, the Prime Minister visited the local parent and toddler group at St Andrews Church of England First School. This visit was part of a day-long tour to hear views first-hand from workers, families and firms from across the UK’s regions and nations. I’ve been in Hexham today to listen to what matters to families here on Brexit and beyond. In a year’s time we’ll be leaving the EU and it’s important we lay the ground over the coming months for a future where these children, and children across the UK, can flourish and reach their full potential. The North East is already home to great schools, renowned universities, and thriving research, manufacturing and cultural sectors. It’s my mission to make sure that this continues and develops, and that no community is left behind as we plan both our domestic agenda and our Brexit strategy. That’s why my government has been working closely with Northern businesses and stakeholders to boost growth and ensure their interests are truly represented in the Brexit negotiations. Today, the government has also announced it is investing almost £15 million to build on work to improve the flow of ideas between universities and businesses in the North East. The projects being funded are expected to create jobs, enable the North East to better compete in the industries of the future and lead to environmental benefits. Part of the Industrial Strategy, the Connecting Capability Fund will support a partnership between Durham, Newcastle, Northumbria and Sunderland universities, allowing them to promote tech and industrial sectors across the region. Another funding stream will allow York, Hull and Teesside universities to collaborate more closely to boost the area’s biosciences research. The North East has seen promising signs in the economy in recent years. Since 2010 there are almost 19,000 more small businesses and there are more than 250,000 apprenticeships.